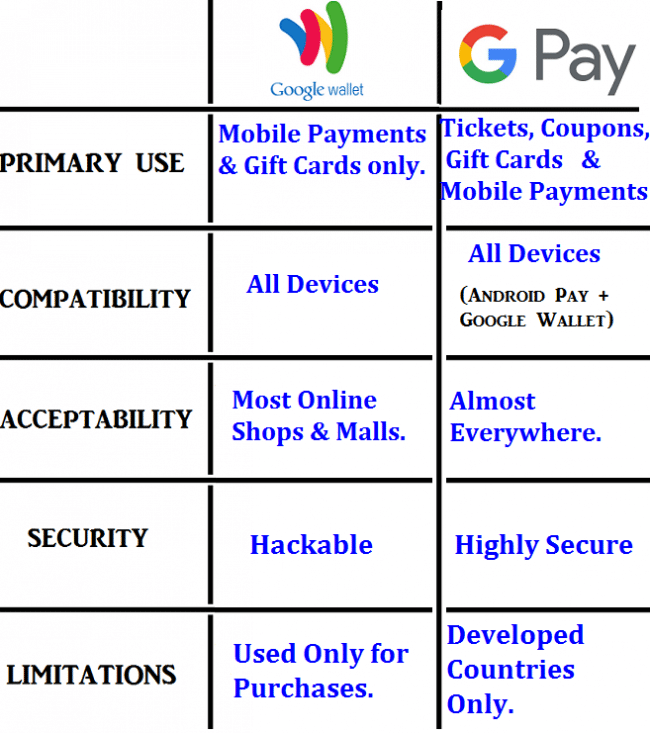 Difference Between Google Wallet And Google Pay. Google is set to introduce a mobile wallet that will incorporate all the other services. All the payment tools are going to be united under one brand and that is Google Pay. The Android Pay app on Android is stuck with the existing brand,but that will also change. The app will get an update and some new features and functionality will be introduced to try and make the payment service ubiquitous both in stores and on the internet. In addition to this, Google will also launch a redesign of the Google Wallet app for sending, receiving and requesting money and is called the Google Pay Send. Google Pay is expected to make it’s way through all Google’s products including Assistant and Chrome. Just like with Android Pay, you will be able to use all the cards and payment information stored in Google Pay across a huge variety of apps and websites when using an Android device or Chrome. Google Pay is also going to work for transit in cities including London, Portland and Kiev but this will depend on where you live and how the city’s public transportation looks like. •	Google Walletwas launched in 2011 and at one time the app supported NFC payments. – Google Pay is a combination of both the Android pay and Google Wallet. – The new app is divided into two. A “Home” tab showing the recent payment activities, nearby local offers and stores and any information using Google’s card-style interface. – The “Card” tab is where all the individual credit, debit, reward and gift cards are stored. •	Google is working to integrate its Venmo-like service from Google Wallet directly into the Google Pay app for the UK and US markets. – For now, the company is rebranding the Google Wallet app as Google Pay Send with the updated design matching the rest of Google pay. •	One thing to note is Google Wallet is not entirely brushed off the Android phones. – Google Pay combine both Android Pay and Google Wallet, but that doesn’t mean these apps will immediately be removed from the store. – Google Pay has combined the services of these apps into one. •	Google wallet is for friends and family who have a U.S debit card sending money via their iOS and Android devices. – Android pay, on the other hand, was used by users who make online retail and in-app purchases using their Android devices. – Google Pay has come and put all these services into one. – With the app, you will be able to pay for items online, use the same app to send money to friends, use it for shopping using NFC in-store as well as in other services that accepted Google payments. •	With Google Pay, you rack up more rewards from your rewards and loyalty cards. – You just add your cards to the app and select merchants and you will receive exclusive offers and reminders to use the royalty cards when you enter the store. •	All your card and account information is well secured and encrypted by Google Pay. – The app protects your payment information with multiple layers of security using the world’s most advanced security infrastructure to keep the information safe. •	Paying on sites with Google Pay is as quick as just clicking. – Look for Google Pay and spend less time checking out and more time checking out. – You can quickly pay on thousands of websites. Google Pay is a new system that ensures saved payment information in your Google account will be available anywhere you use Google products. This includes in YouTube for subscriptions renewals, in Chrome for web purchases, in apps on Android forin-app purchases and at NFC enabled retail outlets. The existence of Google Pay was spurred by the overlap between it’s services. You have experienced how Google helps you easily pay for things online and in stores. This is the overlap between Android Pay services and Google Wallet that brought Google Pay into existence. With Google Pay, it now becomes easier with all your payment information saved on your Google account so you can swiftly checkout with peace of mind.